Ever since I began beading I have always had a love for drop and dagger beads. This series grew out of wanting to find as many different ways to use dagger beads as I could. I have often used them in my work but this time wanted to highlight them, rather than have them as a feature with lots of other beads. 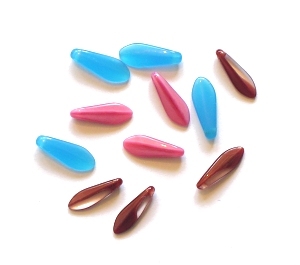 The idea developed from looking at dagger beads and realising that they'd make perfect flower petals.